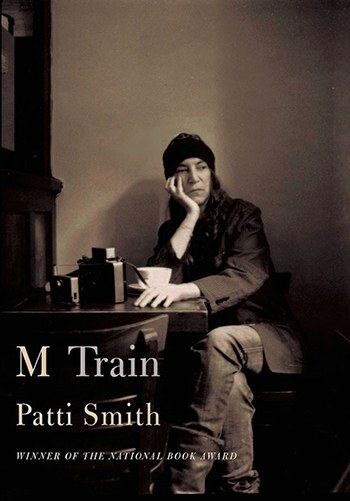 Every chapter in M Train digs a fresh grave in the chambers of Patti Smith's memory. Patti Smith’s new book, M Train, is better than Just Kids. There, I said it. When I read Smith’s exceptional and touching chronology of her young life orbiting Robert Mapplethorpe’s, I loved it as much as everybody else did and I was psyched when it won the National Book Award. After reading M Train, it will be clear to any reader that Smith’s formidable twin powers of rhetoric and compassion were actually only operating at half-mast last time. M Train casts the kind of spell that one must return to over and over again. Her first line proposes that “it’s not so easy writing about nothing”. Indeed, the surface of this book purports to be a meandering and even random collection of journal jottings that may have a few common threads but really no ultimate focal point or theme. Don’t fall for it. In fact, each chapter treats an important loss in her life, from such heartbreaking historical moments as the death of her husband, Fred Sonic Smith, to such private griefs like the sudden misplacement of her favorite coat. Every chapter digs a fresh grave in the chambers of her memory. She moves between these reflections on actual events through the use of dreamscapes. With the occasional aide of a guru cowboy present in her imagination, Smith crafts extremely fluid transitions between her event memory, her creative instincts to romantically transform the real event, and her meditations on how to cope with what she’s learned from the event. Even carefully attentive readers will catch themselves in mid-flight, having to go back and skim the previous paragraph to be sure the trajectory of that arrow of their attention can strike true. The train is her metaphor for this dreaminess. “I followed whatever train I wanted”, she says. “I wrote about writing—of genies and hustlers and mythic travelers—my vagabondia” (72). We glide into each station with her, holding on to whatever solid objects we can as Smith imbues each of them with a totemic holiness. She sees soul in the smallest pebbles. Literally, there is a great story in one of the first few chapters about embarking on a pilgrimage to French Guiana to see the prison at Devil’s Island in order to pick up a pebble. Genet had always felt destined to be jailed there, but he ultimately was not. So Smith, displaying her characteristic deep empathy, travels across the world to go there on his behalf and collection three tiny rocks from the prison yard, intent on delivering them into Genet’s hands via their mutual friend, William Burroughs. Nobody asked her to do it, but she felt called to perform this act of minuscule yet extreme service to a writer she loved. Some of the stations are faraway sojourns like that. She goes to Greenland to give a talk on Wegener’s Artic expeditions to the semi-secret society of the now-defunct Continental Drift Club, of which Smith somehow became member number 23 out of a total of 27. In one of the few moments where Smith recognizes her own celebrity, she is summoned in the middle of the night to have a long talk with chess master Bobby Fischer. But then, utterly humanly, they just sit around singing Buddy Holly songs together. She also visits Japan, brought there by her extreme fascination with Murakami’s The Wind-Up Bird Chronicles, and ends up washing the tombstones of two fiction writers who each committed suicide. She has lost her CDC membership, Buddy Holly and Bobby Fischer, some Japanese short story writers, and then eventually her thoroughly annotated copy of the Murakami book in an airport bathroom somewhere. Those are grand adventures, to be sure, but it’s actually in her efforts to convey dailiness where M Train really shines out from the pack of brilliant writings Smith has produced to date. “Not all dreams need to be realized. That’s what Fred used to say”, she recalls. “We accomplished things that no one would ever know” (86). To borrow a phrase from Michel de Certeau, it’s Smith’s practice of everyday living that should most intrigue readers of M Train. For starters, there are several kinds of lists a reader could make, if one is interested to take recommendations based on Smith’s own preferences. On the food list: brown toast and olive oil for breakfast, dumplings in the middle of the night, green-tea soba noodles for celebration, spaghetti with green onions and anchovies for dinner at home, and coffee coffee coffee of all kinds at all times of day and night. She likes carbohydrates and caffeine. On the reading list just from the first 50 or so pages of this book: Dante, Verlaine, Mrabet, Genet, Bulgakov, Blake, Auden, Sebald, Wittgenstein, Sarrazin, Murakami, Nabokov, Aira, Daumal, Artaud, and Musil. Smith’s tastes tend toward the romantic in poetry, mythology and philosophy. Readers will also delight in the list of things that annoy her. There are several good jabs in there for airports, from security to check-in kiosks. Of course, she is also annoyed by war in all its various forms. The best is when she arrives at Café ‘Ino for her precious morning ritual at her special corner table for one, only to find an obnoxious woman sitting in her favored seat. Smith won’t sit in any other seat. Sometimes if her table is taken, she gets confrontational. Sometimes she just wigs out a little bit and hides in the bathroom until the other patron leaves. Café ‘Ino, run by a Mexican cook named Zak, is Smith’s personal daily church. She eats and reads and writes there every day for many years, right across the street from her apartment, until one day Zak announces that he is leaving to open a new place on the boardwalk. The cover image on the book jacket was taken on the occasion of Smith’s last mournful moments at Café ‘Ino. The disruption to her everyday life is plain on her face. Zak gifts her the table and chair, carrying it over to her apartment for her after closing the shop. She soon visited his new cafe in Rockaway Beach, stumbled across a dilapidated old house for sale, got obsessive about it, made a handshake deal with the inside of the house totally unseen, gigged all summer to save up money and then paid cash for it—and then Hurricane Sandy hit. Smith’s profoundly strong ability to exercise patience is constantly on display during this and other such losses, despite her claim that she has “always hated loose ends. Dangling phrases, unopened packages, or a character that inexplicably disappears” (96). She respects that life is nevertheless full of loose and lost ends. In this same vein, Smith watches a lot of detective shows. She happily plops down in front of her little television to watch CSI: Miami and other such crime procedurals. There's an entire chapter near the end of the book devoted to a personality profile of Sarah Linden, from The Killing, and elsewhere a lengthy analysis of the difference between the American version and the original Danish version. Once, Smith stayed on an extra week in London just to watch a marathon of Cracker, a British crime drama that is apparently somewhat hard to find in the U.S. Smith refers to the job of a writer as “the visualization detective” (65) and in struggling to complete a 100 line poem, remarks, “ninety-seven clues but nothing solved, another cold-case poem” (31). Through the book, she is preoccupied by time: the time elapsed since her husband’s death, the time spent on airplanes and jet lag, the time slot for her television shows, the beauty of spending winter holidays in isolation, the occasional bouts of insomnia, the endless waiting that is such a part of every life and real time, and the writerly problem she faces in moving too seamlessly back and forth across memory in the not at all chronological recounting of these stories. Ultimately, she rests this dizzying thread of concern on an image of a clock with no hands. The other place she rests the time problem is in the comfort of spaces. M Train is the first book to properly incorporate Smith’s photography into her storytelling. All but a dozen of the images in Just Kids belonged to Mapplethorpe. All the images in M Train belong to Smith, and they serve both as a wonderfully tight anchor to the stories in the text as well as a sort of unusual history museum unto themselves. There are a few family photos, of course, but mainly Smith is invested in special objects: her father’s desk, her husband’s boat, Frieda Kahlo’s crutches, Tolstoy’s stuffed bear, Plath’s gravesite, Hesse’s typewriter, the pylons at Rockaway Beach. There are about 50 black and white photographs in the book, rendered into the most vivid colors by Smith’s accompanying prose. Like everyone on Earth, Smith is a little unhappy sometimes. Time and loss provoke a restlessness in us all. She often plays a game with herself, developed to resolve her occasional insomnia: “One proceeds by uttering an uninterrupted stream of words beginning with a chosen letter, say, the letter M. Madrigal minuet master monster maestro mayhem mercy mother marshmallow merengue mastiff mischief marigold mind, on and on without stopping, advancing word by word, square by square” (107). But none of these puts the M in M Train; it comes from chapter 12: Mu, the Japanese word for nothingness and a bedrock concept of Buddhist koans meaning essentially to unask a question. What are we asking of Patti Smith? If the premise of the question is so fundamentally flawed that it cannot be answered, one sinks into sadness. This happens to Smith herself: “Without noticing, I slip into a light yet lingering malaise. Not a depression, more like a fascination for melancholia, which I turn in my hand as if it were a small planet, streaked in shadow, impossibly blue” (25). In the end, devotees of Smith’s work should not be satisfied with the historical account of Just Kids, beautifully written though it definitely is. The real delight of Smith’s work is how simply and daily she strives to embrace those mundane realities with which we all struggle. In the constant grip of what has been lost and mourned and pulled toward the abyss, she just wants readers to be human with her, to be familiar as a throughput to the kind of compassion that ultimately bolsters an optimism needed for making life livable. “[Portals of the world] float through these pages often without explanation. Writers and their processes. Writers and their books. I cannot assume the reader will be familiar with them all, but in the end is the reader familiar with me? Does the reader wish to be so? I can only hope, as I offer my world on a platter filled with allusions” (68).